When most people think of a career in sales, they don't consider the hospitality industry as an option. Most think of hospitality careers consist of restaurant managers, front desk workers, housekeepers, and managers. The truth is, however, that hotels and resorts are driven by sales professionals helping sell rooms, fill the lobbies and keeping the restaurants humming. For the most part, the sales professionals employed in the hospitality industry are focused on B2B sales. Their days are spent visiting local businesses to champion how their hotel/resort has the resources and team needed for them to host a team meeting, or a customer invited event. These sales professionals need to understand their competition and know how to sell their establishment's services too often very exact needs of their prospects and customers. These sales professionals also need to have strong networks within their local communities to not only draw leads and local opportunities but also to partner with local businesses to provide more local resources for businesses visiting their establishment from out of the area. These relationships with local businesses can and should be symbiotic: One business supports the other in a mutually beneficial way. Go to work a few minutes before your "official" starting time and walk through the entire hotel or resort. Visit as many of the guest rooms as possible, paying attention to the furniture, fixtures, location, cleanliness as well as any other factors that give each room its flavor. Walk down the hallways, visit the public area restrooms, again while checking for cleanliness and the overall ambiance. Spend time walking around the lobby, visiting the meeting rooms, any restaurants, bars, pools, and gyms. Introduce yourself to every one of your co-workers whom you haven't met yet. Talk to them about what they do, how they do it and ask them about their unique "tips and tricks." If available, review any literature in the lobby or guest room that display area attractions, restaurants, and hotel or resort services. Lastly, make sure you take a close look at the entire hotel/resort from the viewpoint of a guest. As a sales professional in the hospitality industry, what you sell is everything about your establishment. You sell the quality of the guest rooms, the comfort of the meeting rooms, the skills of the housekeeping staff and the relaxation found in the pool/spa area. You sell the local area, your restaurants and the professionalism of your lobby and front desk staff. Thinking that your job is book meeting rooms, putting "heads in the beds" and getting customers to book out as many rooms as possible is shortsighted. While doing these activities may be what you are compensated on, your focus needs to be much broader and include every little thing about your establishment and the surrounding community. 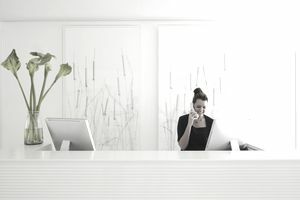 Sales professionals in the hospitality industry spend most of their working hours building their networks and contacting clients and prospects. Some sales professionals are fortunate in that they receive communications from interested businesses. These professionals usually are competing with a select number of other area resorts/hotels and need to be able to understand, convey and close on their establishment's unique values. Those who work for lesser-known establishments or are located in less popular areas, need to spend more time prospecting for business and building up their local and global networks. These professionals have to overcome obstacles in addition to competition in order to get businesses to choose their establishments over any other possibility. Beyond driving business, a sales professional also needs to spend time each day learning more about their industry, improving their skills and gaining a better understanding of what makes their establishment one that businesses around the world would be interested in learning more about.